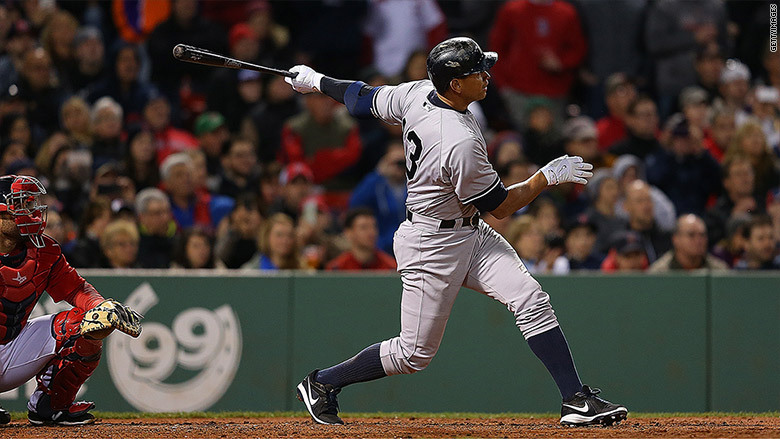 Alex Rodriguez hitting his 660th career home run in Boston on May 1. Multimillionaire Alex Rodriguez doesn't seem too put off that the Yankees aren't paying him a promised $6 million bonus for catching Willie Mays in home runs. But his union is. The Major League Baseball Players Association is preparing to file a grievance against the Yankees on A-Rod's behalf, even though Rodriguez hasn't complained. "We are prepared to do what we have to do," said Greg Bouris, a union spokesman, told CNNMoney Friday in his only comment on the matter. The contract A-Rod signed with the Yankees after the 2007 season called for him to get a $6 million bonus for reaching each of five milestone home runs, starting with No. 660 matching Mays. The bonuses were called "marketing agreements" -- meaning the Yankees would pay A-Rod for the right to promote the milestones. At the time, A-Rod was a popular superstar. But since then, of course, he has twice admitted to using steroids, and was suspended for a full season. Yankees General Manager Brian Cashman said last weekend that the team believes it is living up to the contract even though it isn't paying the bonus. The contract, Cashman said, gives the Yankees "the right but not the obligation" to pay A-Rod. A-Rod hasn't said much publicly about the issue, telling reporters that the bonus is "family business." It's not like he needs the money: Rodriguez is owed $61 million for this year and the next two seasons, no matter how he performs on the field. But the union is committed to the idea that players should get all the money they are promised. Gene Orza, the union's former chief counsel who helped craft the A-Rod "marketing agreement," said the deal was a clever way around MLB rules that ban certain kinds of bonuses. According to Orza, A-Rod and Yankees President Randy Levine had negotiated $30 million of milestone home run bonuses. But the union and the MLB, which must sign off on all contracts, nixed the plan. So the union and MLB recast the payments as money that would be paid by the Yankees for the right to promote A-Rod's accomplishments. "We gave them a very creative way to get around the rules," said Orza. "The Yankees were never meant to market the guy. They were meant to give him $6 million for reaching 660 home runs." Under MLB rules, players can get bonuses for things a team controls, such as the number of times a hitter comes to bat. Bonuses are not allowed for statistics like a batter's home runs or a pitcher's strikeouts. The reason: to avoid situations where an opposing player could have an incentive to help another player reach a financially lucrative plateau.